Thank you for taking the time to visit Living Lyme’s Kitchen! Please check back often to see new recipes and additions. I am thrilled to provide recipes to help get you started in your endeavor to change your eating habits. The hardest part is beginning. It’s overwhelming when everything you have known is no longer on the list of usable ingredients. This was particularly difficult for me because I love to cook and I love to entertain. Every recipe I ever learned from my mother and grandmother had a secret ingredient: Sugar. Suddenly, I had to completely rethink everything I did. And at the same time, I was insistent on making sure that my food still tasted good, was enjoyable, no one would miss a thing, and it was healthy. This was my biggest challenge. I quickly learned that if I focused on what I COULD eat, and got creative in altering recipes, I could still have almost all of my favorite foods. Bread, of course was out. I just had to deal with that. But, I got used to it pretty quickly. The key is to expand your horizons. Try new things. Get creative. Experiment with different ingredients, spices, herbs, and flavors. Try new meats and new vegetables. Use as many colors of the rainbow as you can. And get creative in your plating. Make it look good, too! In time, you will find cooking can be quite enjoyable. And if it’s healthy for the people you serve it to, it makes it that much better! I will continue to update this and add new recipes as time goes on. I am constantly trying new things and learning new techniques. Now that this website is “done” I can focus on creating more new recipes, so check back often! I have also provided links to some wonderful cookbooks. I am certainly open to suggestions, and I will provide a collaboration of recipes submitted by readers, too. So, please feel free to send them to me! I hope that this helps you to find your own creative inner chef. I hope that you will learn that cooking and eating healthy can be delicious and fun. 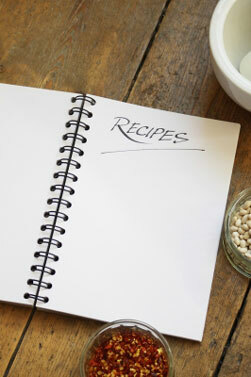 If you have a recipe you would like to share, please contact me along with the name you would like used for credit, and I will add it in (after I try it, of course!). Here’s to good food, good company, and good health! Cheers! I encourage you to experiment and try new things. Adjust these recipes to your taste. If you have a favorite recipe of your own, just alter it to avoid the bad foods. If you get creative, there are not many things that you can’t make. I also tend not to show times, because I’m just not good at that. When it’s done, it’s done. And I just seem to know when to start what. It is a given that my recipes are using fresh organic produce, and quality meats that do not contain antibiotics or hormones. For vegetarians, feel free to substitute vegetable stock and any vegetables and protein sources you would like into any of my recipes.